¤ The natural anti-inflammatory, analgesic and restructuring properties of the ayurvedic herb Boswellia serrata, of glucosamine sulphate and of methyl-sulphonyl-methane (MSM) are particularly beneficial for controlling the acute and chronic pain associated with joint problems. These nutrients are acknowledged for their efficacy, which has been confirmed by many studies. > Complementing oral supplementation with topical use of a cream containing these nutrients is a good idea and produces faster and more localized results. 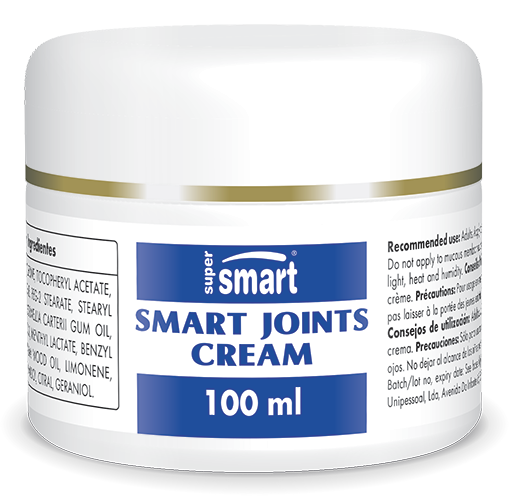 > Smart joints Cream contains active concentrations of Boswellia serrata extract, glucosamine sulphate and methyl-sulphonyl-methane (MSM), in a particularly well-absorbed form. Apply to the painful area and massage into the skin until absorbed. For external use only. Do not apply to mucous membranes, broken skin or near the eyes.